ANS 37:2 “Relationships and Health” just published! 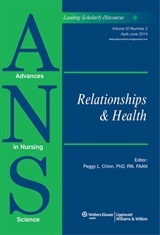 The topic of this issue of ANS – Relationships and Health – is central to nursing practice, and yet this vital connection is often taken for granted. 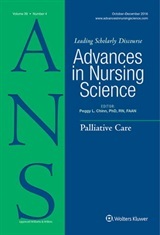 Articles in this issue focus on family relationships, philosophic and theoretic foundations of human caring in the nurse-patient relationship, and the complexities of these relationships on health and well-being. Each article in this issue is featured in our “Editor’s Pick” section of the ANS web site, and while an article is featured, it is available for free download. It is also featured here, along with a message from the author that provides interesting background about their work. Watch the web site to see which article is currently featured, and return to the blog regularly to see messages from the authors! St-Amant, Oona; Ward-Griffin, Catherine; Brown, Judith Belle; Martin-Matthews, Anne; Sutherland, Nisha; Keefe, Janice; Kerr, Michael S.
Ray, Marilyn A.; Turkel, Marian C.